Life Saving Skills is our last post on subject of World Heart Day Campaign. First Aid to Save a Life Pakistan started this campaign from September 25, 2011 and posted their first blog with name of World Heart Day and posted two other special posts on Sep 29 (Save Million Hearts) and Oct 02 (How to live healthy life) 2011. By knowing the signs of cardiac arrest and heart attacks you can ring the emergency services (1122 in Punjab & KPK and others like Edhi and local EMS) as early as possible and help to reduce the amount of time it takes before someone gets professional treatment. 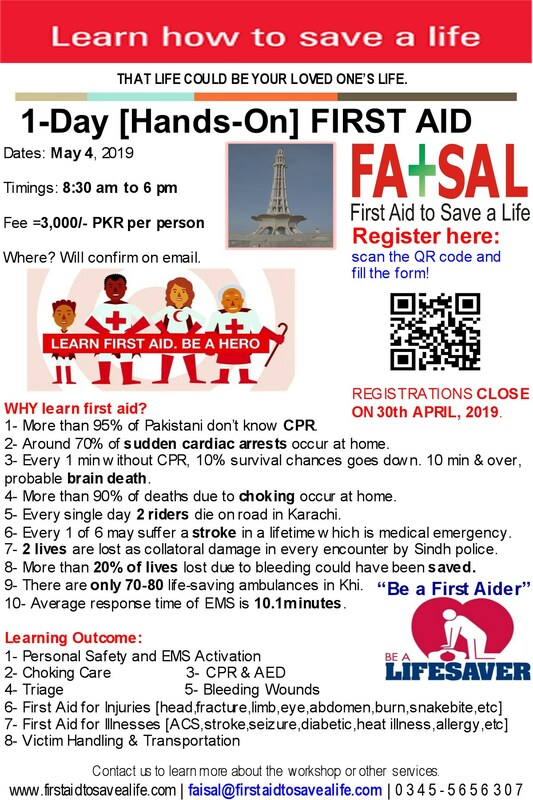 You can also learn emergency life supporting skills (also called Basic Life Supporting; BLS; Skills) through certified and good reputation training resources available from local (Pakistani) market. What you can do to save a life? Knowing what to do when someone has a cardiac arrest is important. If you can do CPR you can buy the time needed for professional help to arrive and save the life of your loved one. Being able to do CPR more than doubles their chance of survival. Cardiopulmonary Resuscitation (CPR) and use of Automated External Defibrillator (AED) are life saving skills. A defibrillator is a life-saving machine that gives the heart an electric shock in some cases of cardiac arrest. This is called defibrillation and can save lives. Cardiac arrest is when the heart stops pumping blood around the body. When someone has a cardiac arrest, defibrillation needs to be prompt and until such time you can perform CPR to gain time. Here’s a real-life video showing the aftermath of a road accident, where an unconscious biker has ended up beneath a burning car. What happens or what did you observed? They all, every one of them, immediately retreat and leave the casualty lying prone on the road after recovering him underneath the burning car. Granted, there is a burning car nearby and the policeman does gesture for them to move away. But think of how determined they all were to get him from under the car just seconds earlier, and how willingly they all now fall away and left him near to associated hazards. The reason why this happened is easy to explain – it’s called the bystander effect. In a nutshell, pulling someone from under a car is dangerous and needs bravery, but otherwise it’s a pretty straightforward ask. Anyone can do it. However, most people are deeply uncomfortable with first aid and, especially when there’s a group present, people generally decide that it’s someone else’s job to step in and help. In such a situation, all someone needed to do was roll the guy on to his side and lift his chin: technically known as the recovery position. That would ensure that, even if the casualty was unconscious, he’d still be able to breathe. Although he was saved and recovering in hospital as told by his uncle. In such cases you might have to deal with psychological first aid skills or got to control with emotional affects of accident. Therefore, we suggest you to learn basics of first aid skills those will benefit you, your family, relatives (while celebrating religious, national or family occasions), neighbors, colleagues, office staff and public. Also, do remember your numbers (cholesterol, blood sugar, blood pressure and body mass index) to live healthy life. This entry was posted in World Heart Day and tagged AED, automated external defibrillator, basic life saving skills, CPR, CPR and AED for Adults, life saving skills, life saving techniques, what to do if heart stops working, world heart day campaign. Bookmark the permalink. It’s amazing and really informative Post. Before that i was heard about that first aid courses and but i was not taking it seriously. But reading your post I have changed my mind I decided to join first aid training program……. Help, I’ve been informed and I can’t bcemoe ignorant.